Arcaclear is an higly resistant transparent binding and waterproofing resin which waterproofs glass, glass brick, ceramic tile, mosaic tile. Waterproofs surfaces made of loose tiles, mosaics, stones or other aggregated decorative surfaces, waterproofs porous trowelled surfaces, waterproofs tiled terraces and balconies without having to tear out tiling and waterproof from beneath. 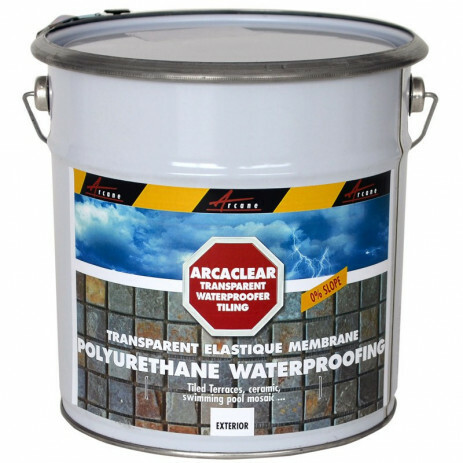 ARCACLEAR is a one-component polyurethane transparent resin which renders a transparent waterproof membrane. 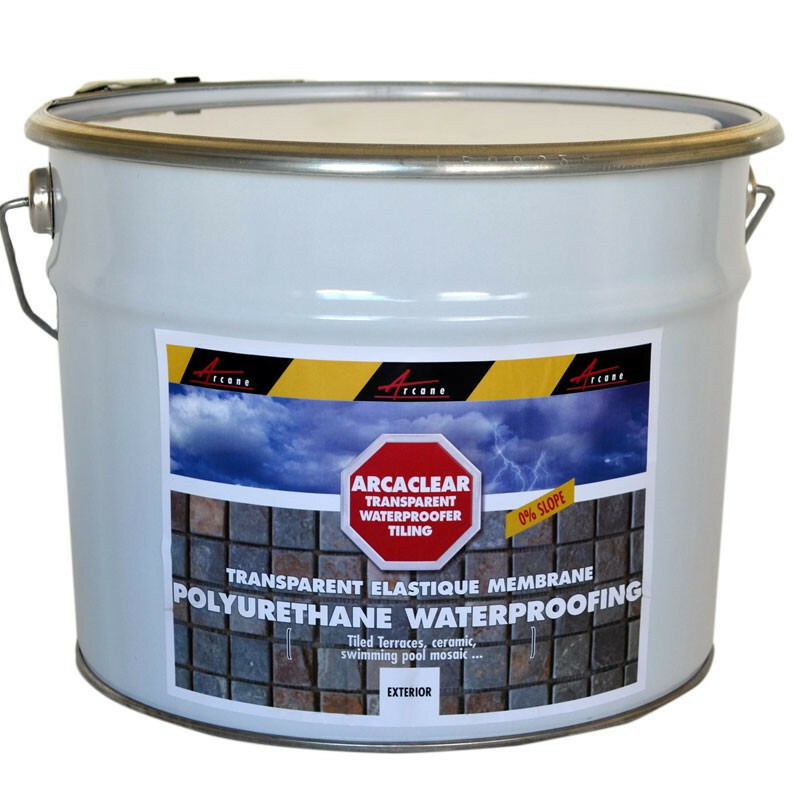 An high-technology waterproof membrane, ARCACLEAR renders a non-yellowing, alkali and UV resistant waterproof coating with long-lasting transparency and elasticity. Even after ageing ARCACLEAR will protect your building materials from the elements, water ingress, freezing, pollution and acid rain. 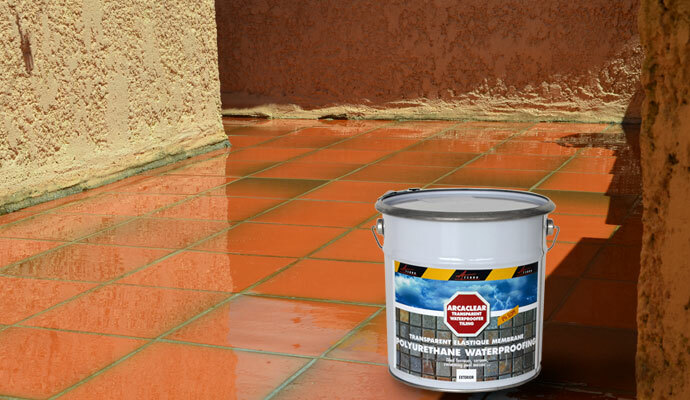 It is particularly suited for waterproofing over tiled terraces, glass or glass brick, swimming pool mosaics or any surface which is decorative and which you do not wish to cover with a non-transparent waterproofing solution. The ARCACLEAR kit is packaged to treat 5m² (approximately 50 square feet) or 10m2 (approximately 100 square feet) per kit. ARCACLEAR uses a unique moisture triggered curing system which does not form bubbles. 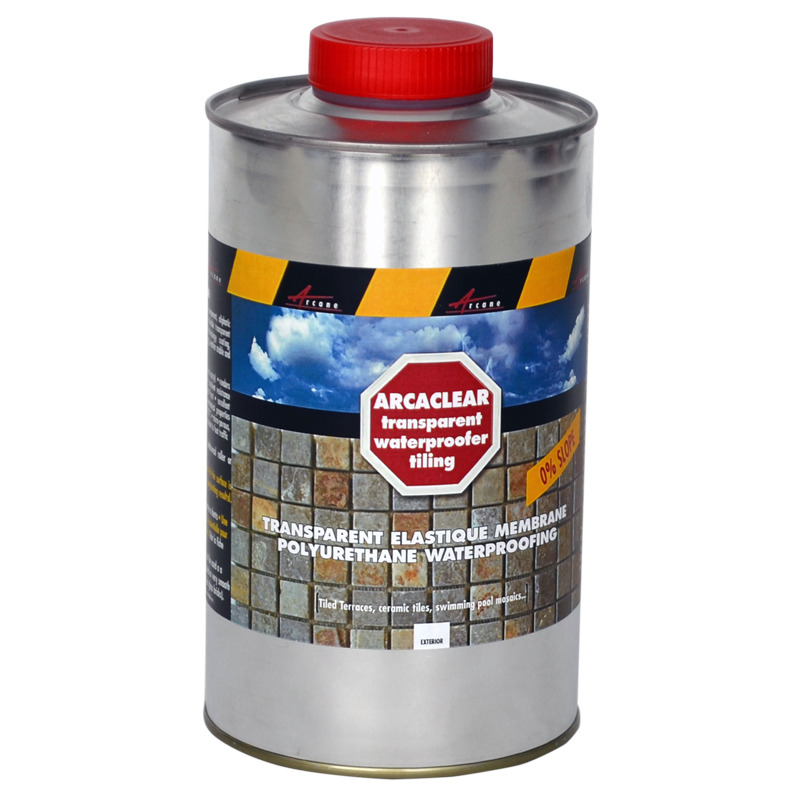 Also used as a transparent binder resin for sand carpet exterior floor coatings binding decorative elements such as coloured quartz, small flat stones etc., ARCACLEAR creates protective coating for your balconies or terraces. 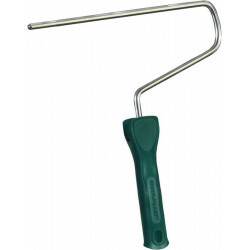 It can be rendered anti-grip. 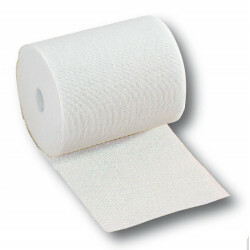 ARCACLEAR can also be used to bind and waterproof porous towelled surfaces. Decorative elements such as coloured quartz or sand carpets are bound together by the resin leaving you with a decorative and waterproof surface. ARCACLEAR protects all types of surfaces : wood - plastic - inorganic matter, and prevents carbonation and corrosion of concrete bars. Important: The ARCACLEAR transparent waterproofing coat will cure well under normal climatic conditions (5-35° C, dry weather). Lower temperatures will slow down curing time and higher temperatures will accelerate the curing time. 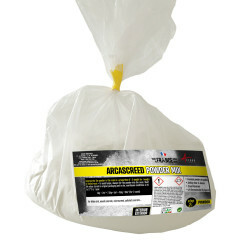 New concrete must be left to dry at least 28 days before applying ARCACLEAR. Glass and glazed surfaces must be primed with ARCACLEAR PRIMER. (5) Arcaclear can then be poured out onto the surface from this large opening. Note: The openings can be sealed with scotch tape (the product will thicken slightly but will not deteriorate). We recommend applying a coat of ARCACLEAR PRIMER P1 or P2 before applying ARCACLEAR to obtain optimum adhesion to all surfaces except transparent plastics (polycarbonate, polyacrylate,etc.). Your choice of primer will depend on whether or not your surface is porous or not. 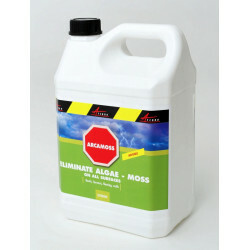 Use ARCACLEAR P1 on non-pourous surfaces such as glass, linoleum, travertine and other "closed" building materials. ARCACLEAR P1 is obligatory when applying ARCACLEAR to non absorbent glazed surfaces such as ceramic tiles or glass bricks. 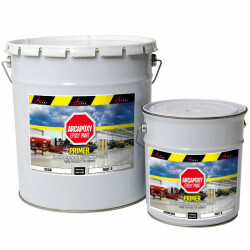 Use ARCACLEAR P2 to prime porous surfaces such as screed, concrete or cement surfaces. 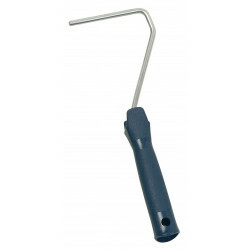 For more information, see the product data sheets. Using a dry clean cloth, apply 1 coat of ARCACLEAR P1 or ARCACLEAR P2 0,100 kg/m², rubbing the product into the surface and making sure that no area is left uncovered. Change cloths often to ensure full degreasing while applying. 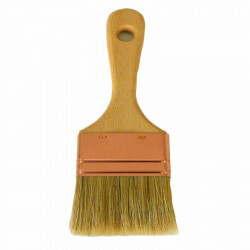 Using a roller or a tooth or serrated trowel, apply the 1st coat, covering the entire surface area. The ARCACLEAR will dry to a shiny glazed finish. VERTICAL SURFACES: (wall, over swimming pool tiling, etc.) 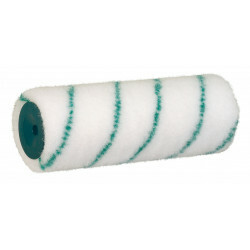 Use a roller and apply 3 coats. In all cases, ensure that the coats are evenly spread and not more than 1 mm thick. If you are ordering both ARCACLEAR RESIN and ARCACLEAR PRIMER (porous or non-porous), you can order in a pre-packaged kit, each kit treating 5m² or 10m2. If you wish to obtain a matte finish, choose "matte" to order the ARCACLEAR MATTE FINISH. If you wish to obtain a surface resistant to foot traffic, choose the kit which corresponds to your use (frequent and heavy in public areas, frequent in private properties for domestic foot traffic, rare foot traffic maintenance only or no foot traffic at all - swimming pools, walls etc.). 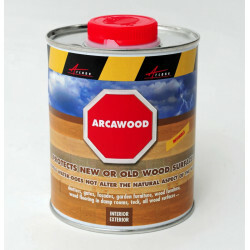 The ARCACLEAR system dries to a shiny finish which can be slippery when wet. 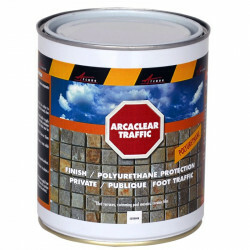 If used on a surface which will be subjected to frequent foot traffic (public and private areas), Arcatraffic must be applied as a topcoat, integrating corondon white grain to render the surface anti-slip and reinforce its traffic bearing resistance. ARCACLEAR MATTE FINISH is a transparent polyurethane coating which will leave your surface treated with ARCACLEAR with a matte finish. Note: Drying time will vary depending on the temperature and relative humidity. 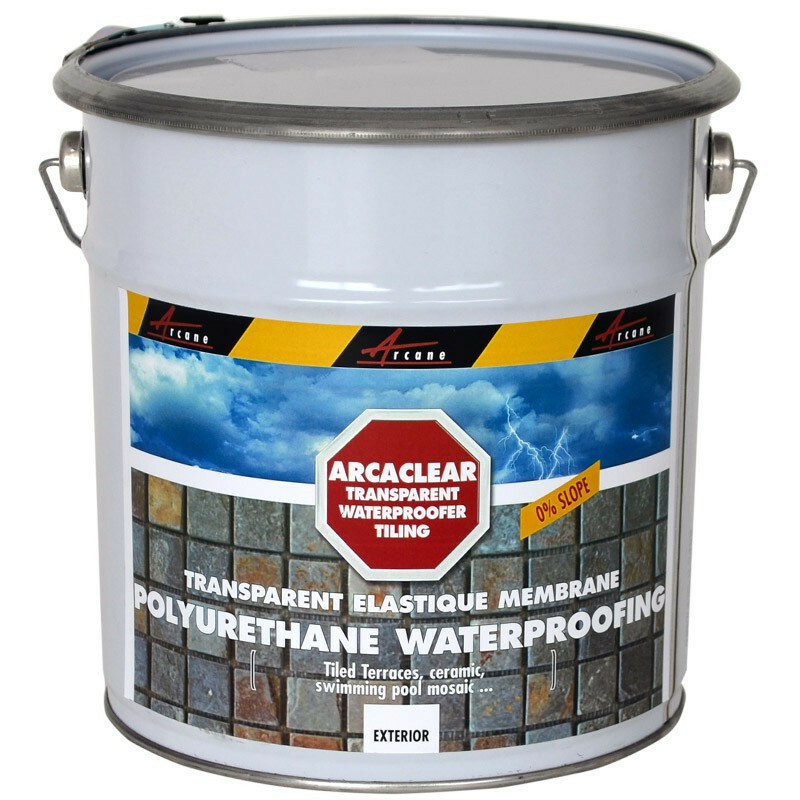 Arcaclear should not be applied if the relative humidity is very high as a prolonged drying time may affect the outcome and performance of the membrane. We recommend applying when the temperature and relative humidity are within standard levels.